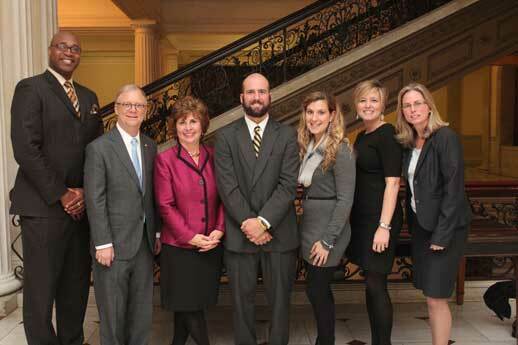 Member Sumwalt (2nd from left) joined AAA Northeast Public & Legislative Affairs Director Mary Maguire (3rd from left), BJ Williams (center) and Sarah Langenthal (3rd from right) – who both survived crashes with traumatic brain injuries – to testify in support of Massachusetts’ Representative Garrett Bradley’s H.B. 1187. Also pictured are NTSB’s Michael Hughes (far left), Stephanie Shaw (2nd from right) and Amy Terrone (far right). On Wednesday, I had the opportunity to testify before the Massachusetts Legislature in support of House Bill 1187 (H.B. 1187). If enacted, H.B. 1187 would allow for primary enforcement of the state’s existing seat belt law. Currently, only 34 states have primary enforcement of seat belt laws. Massachusetts has only secondary enforcement, which means that police officers cannot issue a citation for a seat belt violation unless the vehicle has been stopped for another reason. Primary enforcement safety belt laws give law enforcement officers the authority to stop a vehicle solely for a safety belt violation if he/she observes anyone in the vehicle not buckled up. My testimony came on the heels of Tuesday’s NTSB board meeting, where the NTSB deliberated a highway crash in which four members of a college women’s softball team were ejected from their bus and died. None were wearing seatbelts. As I said in my testimony, these four young ladies would likely be alive today had they been wearing their seat belts. For more than two decades, the NTSB has recommended primary enforcement of seat belt laws, and for just as long, Massachusetts has tried to enact a primary seat belt law. And after seeing too many deaths and injuries that would have been prevented and reduced had seat belts been used, the NTSB once again called on states to enact primary seat belt laws that apply to all vehicles that are equipped with a seat belt—whether it is a passenger car, a school bus, or a motorcoach. When properly worn, seat belts are a person’s single greatest safety defense against injury and death in the event of a crash. However, they are only effective when used, and primary enforcement has been shown to significantly increase seat belt use in those states that have adopted it. Take my home state of South Carolina, for example. In late 2005, South Carolina adopted primary enforcement of its seat belt law. At that time, seat belt usage in South Carolina was hovering around 74 percent. A decade later, seat belt usage in the state is 90 percent! Figures show that states that have enacted primary enforcement seat belt laws have experienced increased seat belt use rates between 5 and 18 percentage points. Today, seat belt usage in Massachusetts is 76 percent—well below the national average of 87 percent. In fact, Massachusetts ranks 46th in the nation for seat belt use. As to be expected, an increase in seat belt usage is associated with a decrease in the number of injuries and fatalities. In her testimony before the Massachusetts Legislature, Dr. Lois Lee, an emergency medicine specialist, referred to a Boston Children’s Hospital study that found states with primary enforcement seat belt laws have a 17 percent lower rate of motor vehicle crash deaths than states that do not. Mary Maguire of AAA Northeast testified that a primary seat belt enforcement law in Massachusetts would save 18 lives each year and would prevent more than 650 traumatic injuries per year, including many life-altering spinal and brain injuries. Some claim that not using a seat belt is a personal choice and affects only the individual. While diverse viewpoints are appreciated and respected, that argument simply overlooks the significant societal costs associated with motor vehicle crashes. AAA Northeast’s Maguire testified that if Massachusetts adopted a primary enforcement law, Massachusetts would save nearly $1 BILLION in four years. That’s based on that fact that crash-related injuries and fatalities pose significant productivity and medical costs. Seat belts save lives. Primary enforcement of seat belt laws is a proven, effective means of increasing seat belt use. Primary enforcement is a law Massachusetts and other states can’t live without. Robert Sumwalt is a Member of the NTSB Board. 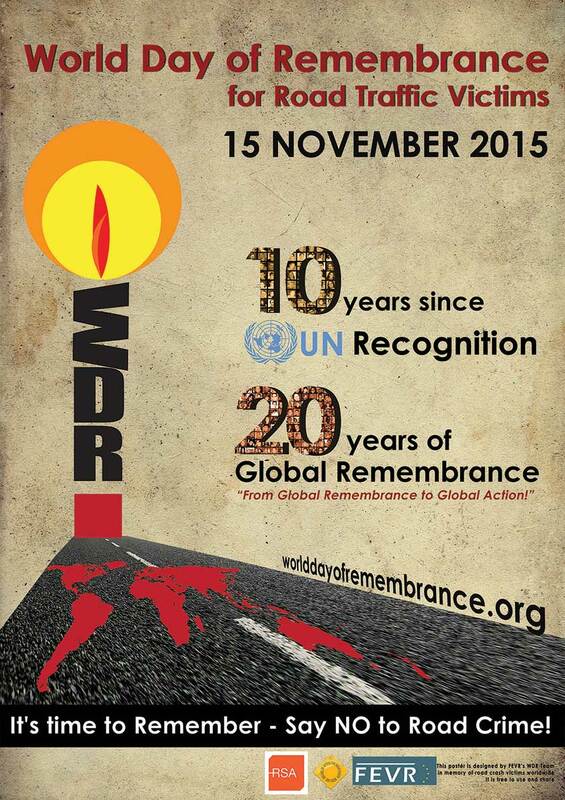 Today marks the 20th Anniversary of the World Day of Remembrance for Road Traffic Victims. On the third Sunday of November each year, we pause to remember all the lives lost on our roads, as well as the families affected by road tragedies and all the emergency responders who rush to the scene. Working for an agency whose mission is to investigate highway crashes, work with victims’ families, and recommend changes to prevent such tragedies, this day has special significance for me and all my fellow NTSB colleagues. Road crashes are still the leading cause of death globally. More than 1.2 million people die each year on our world’s roads and between 20-50 million sustain non-fatal injuries. Young adults, ages 15-44, account for nearly 60% of those deaths. Unfortunately, these numbers have stayed fairly constant since 2007. Before coming to the NTSB, I served as the U.S. Director and Road Safety Director of the FIA Foundation. In that role, I took an active role in promoting the UN Decade of Action for Road Safety, a plan to combat road deaths that the UN General Assembly adopted as part of a resolution in 2010. Having worked to implement this plan and now serving as Vice Chairman at NTSB, I am saddened by these numbers because I know many of these deaths are preventable. Thousands of lives could be saved if we address issues such as speeding, impaired driving, non-use of seat belts and child restraints, non-use of motorcycle helmets, and cell phone use habits. The NTSB works daily to address most all of these issues through our advocacy campaigns. And while drug- and alcohol-impaired, distracted and speeding drivers are often the cause of crashes on our roadways, I want to remind people that the greatest defense to preventing highway deaths is simply using a seat belt or child restraint. In 2013, more than 30,000 people died in motor vehicle crashes on US highways. In nearly half of those deaths, where restraint status was known, people were not restrained. Even more tragic, nearly half of all children killed in crashes each year are unrestrained. When used correctly, child safety seats can reduce fatal injury by 71 percent for infants (under 1 year old) and by 54 percent for toddlers (1 to 4 years old) in passenger cars. And lap/shoulder seat belts, when used, reduce the risk of fatal injury to front seat occupants (age 5 and older) of passenger cars by 45 percent and the risk of moderate-to-critical injury by 50 percent. Our children are our most precious cargo and they look to us to keep them safe. Just this week, the Insurance Institute for Highway Safety issued new ratings for boosters that make it easier for us to choose the appropriate seat for our children when they are not quite ready for an adult seat belt, and their latest ratings show that manufacturers are providing seats that keep them safe. This day is about remembering the victims, those who died or were injured on our roads. But we must also remember the families who must deal with the unfortunate results of these tragedies. If we have not been impacted directly by a road tragedy, we certainly know someone who has been. Every fatal crash causes ripples of grief and loss, often wide ranging, and sometimes lifelong. For those injured, those injuries can be debilitating and long-lasting, and emotional as well as physical. On this day of remembrance, I urge us all to honor the victims and their families by being an advocate for road safety. The NTSB and National Highway Traffic Safety Administration (NHTSA) have long agreed that seat belts save lives. However, progress regarding the installation of seat belts on school buses has been slow and uncertain. School buses are the safest way to transport students to and from school. They are safe in most circumstances because of a design philosophy called compartmentalization. However, the NTSB’s school bus accident investigations have revealed that compartmentalization provides inadequate protection in severe side impact crashes and high-speed rollovers. In those situations, adding passenger lap and shoulder belts can greatly improve safety on school buses. The NTSB is encouraged by NHTSA’s announcement. In the Chesterfield, New Jersey, crash report, the NTSB called on NASDPTS, NAPT, and National School Transportation Association to provide their members with educational materials on lap and shoulder belts and to advise states or school districts to consider this added safety benefit when purchasing seat belt-equipped school buses. Administrator Rosekind also called for the school bus associations to move forward on this safety issue. Our children deserve the highest level of safety no matter what vehicle they are riding in. A properly worn lap and shoulder belt will provide each child the best protection and make school buses even safer. 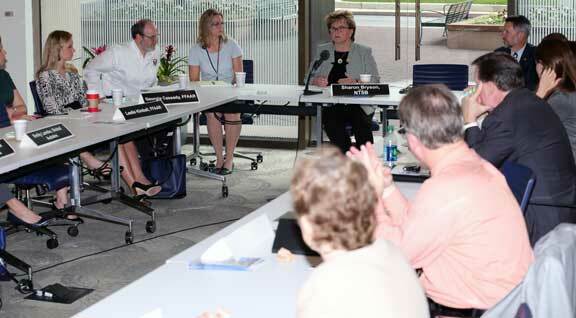 Yesterday, I had the pleasure of hosting a meeting of transportation safety communications professionals. They came from many organizations, each with their own unique missions and capabilities. I began the meeting by saying that our attendees had one thing in common: they all worked for safety, something that really matters. But as the conversation unfolded, I realized that in saying that, I had overlooked the obvious. They had something else in common: they were all passionate, dedicated communications professionals. Our guests openly shared information both about their upcoming initiatives and about the challenges that they faced. They recounted some of their experiences in overcoming the challenges of an ever-shifting media landscape and shared knowledge with one another about getting the safety message out to their audiences. Their spirit of collaboration was inspirational to me, as the director of an office tasked with developing messages based on NTSB safety recommendations and sharing those messages with the public. Just as importantly, their knowledge of today’s communications landscape confirmed once again what I had already seen on countless occasions: in getting transportation safety messages out, we have powerful, committed, and smart allies among safety advocacy organizations. While attendees differed in their missions and agendas, all of us came away committed to working in closer collaboration in the future. It’s my daily honor to work for an agency with an unyielding focus on transportation safety. But yesterday it was a special honor to host the professionals who share the NTSB’s safety mission. This is the type of needed collaboration that will help us prevent crashes, deaths, and injuries in all modes of transportation. To all of yesterday’s attendees, thank you. 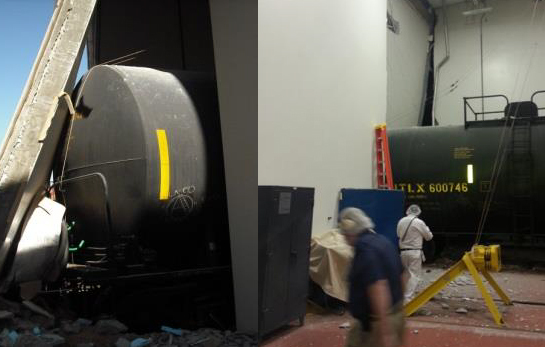 Tank car shoved through the bumping post (right), into the building, and through the back wall (left). On August 7, 2014, a certified locomotive engineer was operating a locomotive to push train cars into a warehouse railroad loading dock in Arden, Nevada. Although the conductor, who was standing on the ground, told the engineer to push the train three-car lengths and then stop, the train continued moving forward—first through a bumping post and then through the wall of the warehouse. Thankfully, no one was injured. Our investigation revealed the engineer was known to have epilepsy (also known as recurrent seizures) since 1992. He told the Union Pacific Railroad (UP) about his epilepsy when he was hired in 2003. Although the engineer had an observed seizure at work in 2008, it did not happen while he was operating a train and he was back to full working status by April, 2009. The engineer told NTSB investigators he believed he blacked out immediately before the accident. Evidence from the event-data recorder indicated that during the accident, the throttle was moved repeatedly when the train should have stopped. During the engineer’s follow‑up medical evaluation, an abnormal focus of electrical activity was found in his brain. We concluded that the probable cause of the accident was the engineer’s failure to stop the train before it collided with the bumping post and the inside wall of the building because he was incapacitated by a seizure (See: The Rail Accident Brief RAB1507). UP followed all required medical regulations when the engineer was hired and when he was allowed to return to work after his 2008 on-the-job seizure. Although the engineer had chronic back pain and had filled prescriptions for high doses of narcotic medication nearly every month for several years prior to the accident, UP did not ask him about his use of medications after his 2003 pre-employment physical because there were no regulations requiring it. Despite the engineer’s prescription narcotic medication, his post accident urine toxicology test came back negative. According to the current Federal Railroad Administration (FRA) regulations, a locomotive engineer with epilepsy—or any other medical condition that causes intermittent episodes of unresponsiveness—may operate a train on any railroad in the United States. In fact, the only occupational medical evaluation required by the FRA for engineers is to have a vision and hearing test every 3 years. Also, although locomotive engineers may not possess controlled substances while at work, they may take any type of prescription medications as long as the prescribing physician knows that the engineer operates trains. The trains these engineers could operate include those carrying crude oil and hazardous materials through highly populated areas and those carrying passengers. For comparison, pilots (including most recreational pilots), merchant mariners, and commercial drivers must regularly pass a medical evaluation that includes a review of their medical history, evaluation of their current medications, measurement of their vital signs, and a physical examination before they can operate in their modes of transportation. In addition, in virtually every other transportation mode, medical standards include a list of medical conditions and medications that an operator may neither have nor use to qualify for work. Because of a series of railroad accidents where a medical condition or its treatment contributed to the probable cause, for 15 years the NTSB has been recommending that the FRA enhance the medical evaluation of railroad employees in safety-sensitive positions (primarily engineers and conductors). The most recent recommendations include requiring a review of their medical history, evaluation of their current medications, measurement of their vital signs, and a physical examination before working in safety-sensitive positions—just like other commercial transportation operators. Over the years, the FRA has held meetings on medical requirements, but has not reported any success in addressing these NTSB safety recommendations, which remain in unacceptable status. As a result, the NTSB determined that the FRA’s failure to establish medical certification standards, other than the hearing and vision tests, contributed to the cause of the accident in Arden, Nevada. Without action by the FRA, such accidents will continue to occur. Fortunately, no deaths or injuries resulted from this particular accident but that was pure luck. Until railroad engineers and conductors are required to meet the same medical standards as operators in other transportation modes, these sorts of accidents will continue to happen. Hopefully, the next one won’t lead to deaths, injuries, or an environmental catastrophe. Dr. McKay is the NTSB’s Chief Medical Officer.